Crap on Wheels. Near Woodman and Riverside. Curb-hogging, tacky, distracting and unneeded, these new advertising signboards–painted steel on wheels–are clogging up the streets and taking up valuable parking space. They are also presenting a danger to drivers who now face another obstruction on the road. 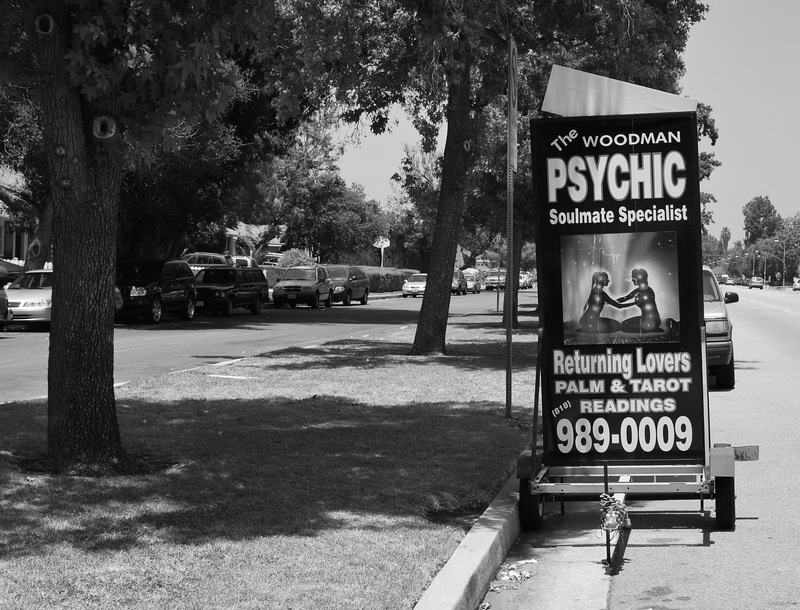 This pleasant neighborhood, near Notre Dame High School, has an uninvited and unwanted guest: a psychic’s psychopathic advertisement placed alongside the trees. Los Angeles must again suffer the two punishments that make life insufferable here: additional traffic obstacles and rampant, unregulated commercial advertising. Re unhitched trailers: there’s a law that anything parked over 72 hours gets towed. Call LAPD/Traffic to turn it in. My neighborhood had “No Unhitched Trailer” signs put up. Andy, that tacky curb-hogging sign on wheels has now become a trashy blog-hogging sign on screen. Aren’t our web surfings already insufferable? While Sacramento is working on the problem of the unhitched trailer, as in trying to(very slowly) create a statewide ordinance banning the things, a new crop of sign issues has cropped up in the former of banners, some to 8 feet tall, advertising every merchant known to man and beast, but especially Subway Sandwiches. Witness 4 of these banners at the center on Ventura at Beverly Glen, for just one subway store. But you think your local councilperson has the huevos to even take on the idea that there might be a sign code violation somewhere nearby – you have to be kidding. The Twin Pauls have no idea what you are talking about in CDs 2 or 5, or don’t care. But I do remember seeing this sign on Woodman near ND High School earlier in the week. An idea – everyone get out your spray can and paint out all the phone numbers on these trailers and or taking off the license plates, or both, and thus making them either illegal or useless to the advertiser. ← Lingenbrink House by Jock Peters, Arch, 1930.